Purposely minimized to fit any décor. Capturing the look of country-style interiors. A bold fusion of tradition & modernity. No need to reach over hot burners. KANSAS CITY, Mo., May 8, 2015 – GROHE, the world’s leading single-brand manufacturer and supplier of kitchen and bath fittings, is the product of choice for designers participating in the 46th Symphony Designers’ Showhouse. The 1910 Georgian Colonial Revival house on Kansas City’s Janssen Place, designated a historic district by the Kansas City Landmarks Commission and on the National Register of Historic Places, provides an ideal showcase for the designers to utilize industry-leading GROHE product. GROHE faucets, shower systems and accessories seamlessly blend quality, design, sustainability and technology so that consumers can feel the difference. "We are very pleased to support the Kansas City Symphony Alliance, Symphony Designers’ Showhouse and the important designers who participated," said Cheryl Dixon, Head of Brand and Trade Marketing for the company. "As the designers can attest, GROHE’s fittings combine a beautifully elegant appearance that can work in a full range of design schemes – from traditional to modern – with quality materials, German craftsmanship and superior innovation for long-lasting performance." Designers chose from a wide selection of products created by GROHE’s award-winning in-house design team, the only team in the industry to have been honored with the coveted international reddot award for Design Team of the Year. GROHE has also won more reddot product awards – 27 – than any other category company. Designers updating the early 20th-century home looked to include sustainable, eco-friendly product, and were pleased with GROHE’s full spectrum of water-saving products – for bath, shower and sanitary installation. Select products with GROHE EcoJoy™ Technology reduce water consumption by up to 50 percent while maximizing the user experience. The materials are eco-friendly, too – the GROHE alloy contains 90 percent less lead than standard brass and is five times more resistant to corrosion. The designers know their work would be enjoyed for many years to come as GROHE products are built to last with German precision engineering and the most rigorous testing in the industry. GROHE SilkMove® technology offers unique faucet cartridges manufactured from an advanced ceramic alloy and coated with a special Teflon lubricant, allowing for near friction-free, smooth operation for a lifetime of use. The GROHE Allure Brilliant faucet against a mirrored wall in the powder room designed by Susan Prestia of Interior Directions. The product is shown at right as well. Susan Prestia of Interior Directions, who designed the kitchen and kitchen powder room, was attracted to the Allure Brilliant faucet with its crisp planes, intriguing angles and cut-out detail that challenges perceptions of what a fitting can be. Its design was inspired by Shanghai’s World Financial Center. The Kensington® faucet from GROHE. 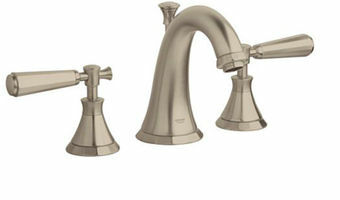 Madi Mali Homes and the design team of Troy Moore, Kelly Stripling, Tammy Gros and Fred Powers selected GROHE’s Kensington® design in the warm Brushed Nickel InfinityFinish™ for their twin sinks in the second floor Jack and Jill bathroom. 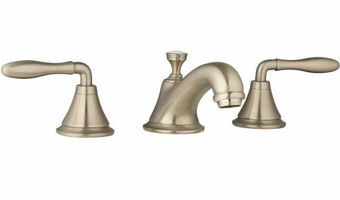 "We love the sleek, timeless design of our faucet. It marries the contemporary and classic style we are known for," said Stripling. "It also feels sturdy and substantial – the quality is apparent when using it. We mixed metal finishes in this bathroom, and this brushed finish tied it all together." Johnson County Community College design students were given free reign in designing the third floor guest bedroom and bath. The tile in the bath dictated a traditional look and the GROHE Seabury® design proves the perfect complement at the sink. Weiss selected GROHE Essence for the Carriage House kitchen. For the Carriage House kitchen and bath, an ultra-modern look was chosen and GROHE delivers beautifully. "The products I specified are streamlined and modern, yet classic and timeless," advises Carraige House designer Kathy Weiss of Decor by Design. "And, they function wonderfully with effortless, smooth operation. My plumber also loves working with GROHE products; they’re so easy to install." 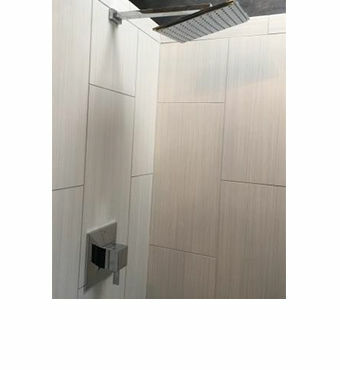 The GROHE Rainshower® Allure shower head and accessories is used by Weiss in the Carriage House bathroom. In the kitchen, she chose the GROHE Essence faucet, which combines concentric cylinders in soft lines and includes a perfectly integrated solid metal pull-out spray. For the bath, Weiss used Allure Brilliant and its geometric plains and angles from the shower to the sink. 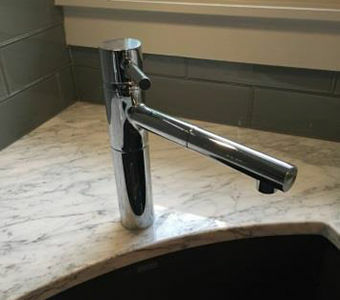 In a design twist, she installed the Allure Brilliant faucet on the mirror for a uniquely contemporary look. The GROHE Rainshower™ Allure shower head offers a shoulder-to-shoulder rain spray and features the proprietary GROHE SpeedClean® anti-lime system as well as GROHE DreamSpray® technology, which offers advanced shower engines that deliver precise and consistent water distribution through any spray pattern for an unparalleled and custom shower experience. The 46th Symphony Designers’ Showhouse benefits the Kansas City Symphony Alliance and is open from May 9 to June 7, 2015. For more information, visit http://showhouse.org/. GROHE faucet and shower products are distributed in more than 180 countries and represent nearly 80 years of excellence in European design, innovation, engineering and quality. GROHE America’s headquarters are in the heart of the Flatiron district and houses the GROHE Live! Center, an interactive showroom created for inspiration and collaboration. The GROHE Group is the world’s leading provider of sanitary fittings, comprises Grohe AG, Hemer; Joyou AG, Hamburg and other subsidiaries in foreign markets. With its global GROHE brand, the GROHE Group relies on its brand values quality, technology, design and responsibility to deliver “Pure Freude an Wasser”. With the JOYOU brand, the Group covers the fast growing Chinese market. The GROHE Group was purchased by the LIXIL Group and the Development Bank of Japan in January 2014. The LIXIL Group is the global leader in the building materials and housing equipment industry. GROHE and Joyou remain independent within the LIXIL Group. 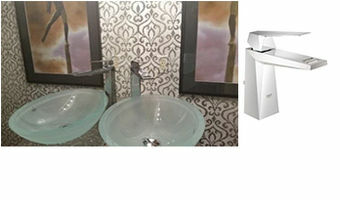 For more information and to find local showooms, please visit www.grohe.com/us or call 1-800-44-GROHE (47643). © 2016 GROHE CANADA, INC.